I'm really enjoying getting back into the blogging groove. The problem? I have sooo many deep thought provoking, soul sharing, enlightening (or so I think) posts but they take time in putting my thoughts into some sort of organization. Time is tight around these parts as I still continue to unpack, move things around and then move around some more, and get organized with my daily routine. But until then I have yet another recipe to share. I posted the other day about my new/old best friend. 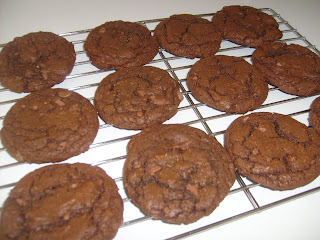 These double chocolate cookies are the first of many recipes I tried using my "new" mixer. Actually the story behind these is it's a recipe we found in a Family Circle magazine at the doctor's office last week. David was drooling so much he asked the nurse to copy the page for us! It was a very user friendly recipe and they are great cookies for bake sales or for gifts. You can find the full recipe at the Family Circle site here . Enjoy! Yum! I'm always looking for a really good chocolate cookie recipe! I'm your newest follower... hope you'll stop by Gallamore West! Well you can thank Family Circle for the recipe! If you like chocolatey cookies (who doesn't) then you'll love these! I had intended to take some to the doctor's office (where we saw the recipe in their magazine) but our family ate them ALL! And... my fam is begging for another batch, yikes!